Spectranet was the first Internet Service Provider to launch 4G LTE internet service in Nigeria and aims to be a leader in the Internet Services space. 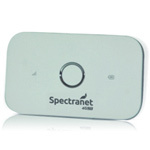 Spectranet provides fast, reliable and affordable broadband Internet services to homes and businesses. Service is currently available across Lagos, Abuja, Ibadan and Port Harcourt. Other states and cities will be added as Spectranet’s 4G LTE network rollout across Nigeria.